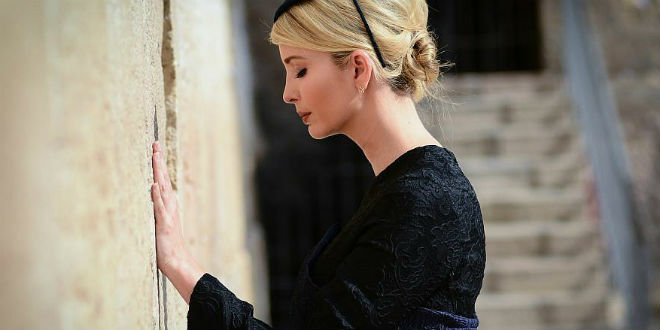 As the Palestinian death toll in border protest has risen to thirty-seven, Ivanka is on Instagram selling jewellery and opening the new US Embassy in Jerusalem. This is the profane and the obscene wrapped delicately in a casual racism and projected expertly across social media. Ivanka and Jared Kushner were blessed on Sunday at a ceremony by Chief Rabbi Yitzhak Yosef who has previously compared black people to monkeys and called for the ethnically cleansing of all non-Jews from Israel. This is government by mannequin – apartheid with aesthetics. This is the zealotry of a convert crafting exquisite Instagram images as children are shot down. Elsewhere we’re told that Israeli troops killed sixteen Palestinians on Monday, including a fourteen-year-old boy and a man in a wheelchair, and some five hundred protesters were injured, at least two hundred by live bullets. This is a new global dynasty. We are in the dark ages. No Republican American president can get through their term without blood on their hands (other peoples) and now Trump has. Let’s hope that this is quota but I doubt it. Sadly, I think very few Democrat Presidents of the USA have managed that feat either. Meanwhile in Brexitland complete silence from the “good Christian” Mrs May on the slaughter of stone throwing protestors. Imagine the outrage had Putin’s finest shot down over 50 stone throwing protestors. The UK and Westminster never fails to disgust. And now the Bu+++er is trying to bully us all over Iran and how long till The Friend of Israel, Mrs May holds off moving her Embassy. Pray for peace .. what empty words..it’s obscene the situation there..if any other state in the world behaved like the us/Israel..the good ole us of a would be in there taking the moral high ground..perhaps not though as they watch the death toll in Yemen thanks to their corrupt arms sales choosing dollars over life..and deciding which dictatorship is worth cosying up to and which one must be removed..I really think it’s time us in the West stopped typing our anger and actually vented it..it is as bad as the Re settlement of Jews only a generation ago..yet you barely read about it..I’m sure there are millions as furious as me..
Or the unbelievable response from Labour Friends of Israel that have blamed todays genocidal Israeli attacks on Hamas. The problem today is not the Trump entourage, it’s a terrorist state once again carrying out it’s daily routine of murder and a compliant western media that deflects the reality of these horrors. But no, let’s mention it today because a Trump is in town. Funny, exactly the same things were happening when Obama was president. You could also have mentioned the fact that Britain sold Israel sniper rifles last year, but hey, I suppose that Trump’s fault also. You are right of course. These things have been happening forever. I do, however, feel sicker than usual seeing those pictures of the shameless Trump daughter and her even more shameless spouse, both unelected yet up to their eyes in previous planning and plotting with the monstrous Netanyahu. And that’s before you even mention the creature who is her father. Sharpesville, Bloody Sunday in Derry. It’s what democracies do. What bit of that don’t folk understand. End of the news broadcast; In good news Meantime, the price of oil is holding high as the top three global producers just happen to be the same people ensuring no peace anywhere in the Middle East. Mhm. Zionism is the identity politics the right likes, but it’s also the variety of victimhood politics which proves the left can recognise the incoherence of its hierarchies of oppression narratives. Important, interesting, and perhaps the only thing capable of moving the Zeitgeist needle onto the next groove. We know the Trump clan and their ilk and their Israeli allies are bastards. What’s more interesting is what grappling with the weaponization of racism (antisemitism) against Corbyn (ie., the left) will mean for the left. We now have a situation where Trump has sent antisemite Christian Zionist preachers to consecrate this Jerusalem Embassy. Jonathon Arkush, recent pres of the Board of Deputies, to select one example, in the vanguard of the Corbyn-hates-the-Jews smears, fetes Trump, but persecutes Ken Livingstone for pointing out (factually, as it happens) that Zionism has a chequered relationship to antisemitism in the form of the Ha’avara agreement between the Nazis and the pre-48 Zionist movement. Who is calling out the hypocrisy of the Zionist s0-called mainstream allying itself with Christian fundamentalist, openly antisemitic elements whilst at the same time using antisetitism insinuations to chill criticisms of the Israeli state? Why aren’t leftists pundits hitting this point hard? Well, it’s because they really aren’t comfortable playing the cynics in a context of identity-victimhood politics. But they’re going to have to learn. And that will be transformative. The sheer contempt of Tory Stephen Crabb towards Palestine was loud and clear today when interviewed by Andrew Neil on the Daily Politics. He essentially refused to condemn the State of Israel. This man is a member of Parliament like many of the others in the Commons, Labour and Tory MPs, whose first allegiance is not to justice or international law or even to Parliament. Their allegiance is first and foremost to the body known as the Friends of Israel. Treacherous shower! We’ve had so much fuss in years gone by about lobbyists having dodgy levels of access to MPs. My goodness, Friends of Israel as a body has an entire team batting for them right across the UK Parliament! Avigail Abarbanel nails it. Israeli settler-colonialism is a loathsome cult.